June 2018 – Sig Nordal, Jr. When reading Obama’s messages, I must admit that I’m on the verge of depression because his views remind me of how great things can be, and subsequently reminds me of how bad things currently are. The amazing L’Auberge de Sedona hotel, Arizona. Located on the banks of Oak Creek, Cress offers New American/French cuisine with a fantastic view of the creek. Wonderful! We all have problems in our life but what matters is how we are handling our problems. Whenever I face any problem and I am not able to do anything about it, in such situations first of all I try to relax. When I find myself surrounded by problems tension stress, I go out for a walk and I quietly observe people near me. There are people in the world who are in more pain as compared to your problem. So don’t let these temporary sadness destroy your permanent happiness. Anyone that thinks America can unite while Fox News is allowed to operate is dreaming. Every single day millions of people form their political opinion based on Fox News lies. This criminal outfit needs to be shut down. 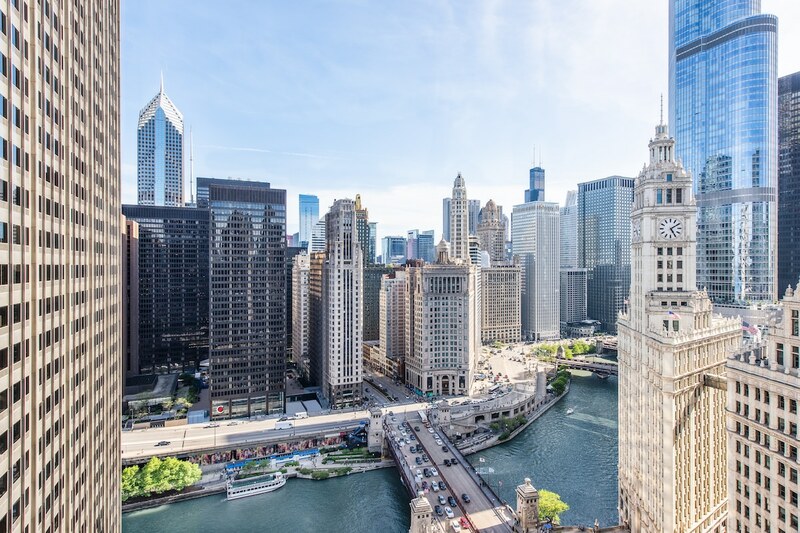 The Chicago Architecture Foundation, a non-profit cultural organization that has been promoting Chicago’s architecture since 1966, is about to get a revamp. 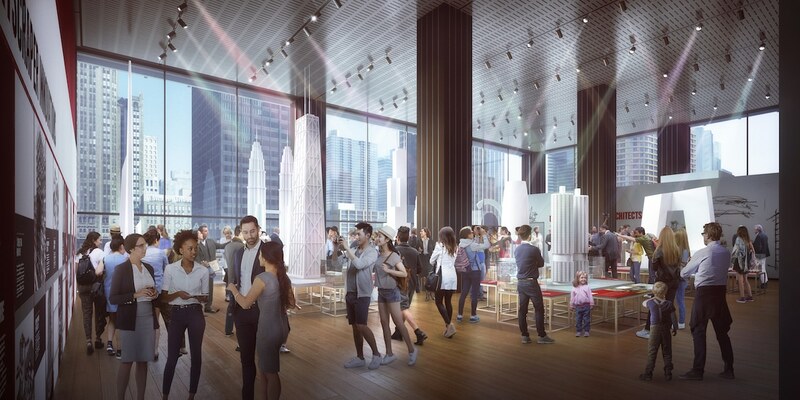 On August 31, 2018, CAF will open the Chicago Architecture Center on East Wacker Drive, providing a new cultural destination for the Windy City. 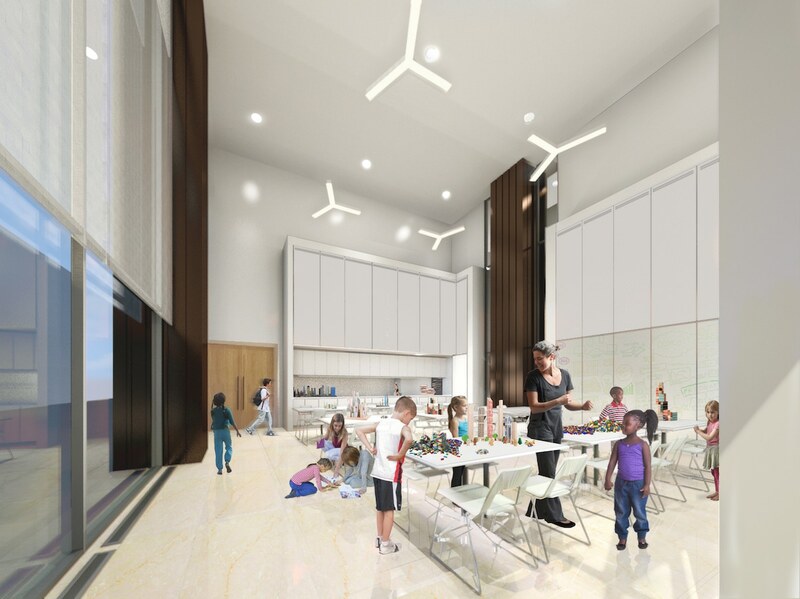 Located inside an architecturally significant building designed by Mies van der Rohe—a pioneer of Mid-Century Modernism—the center will sprawl across 20,000 square feet. 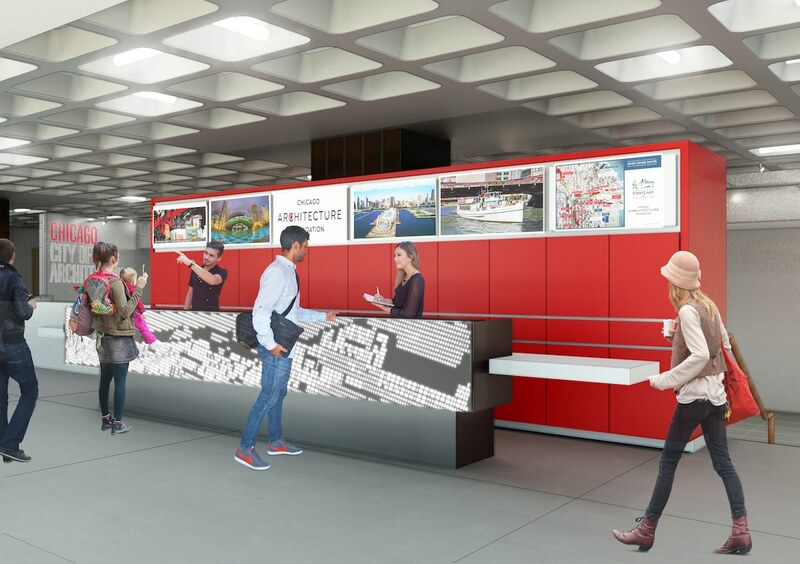 The CAC is strategically located above the dock for the Foundation’s acclaimed river cruises. 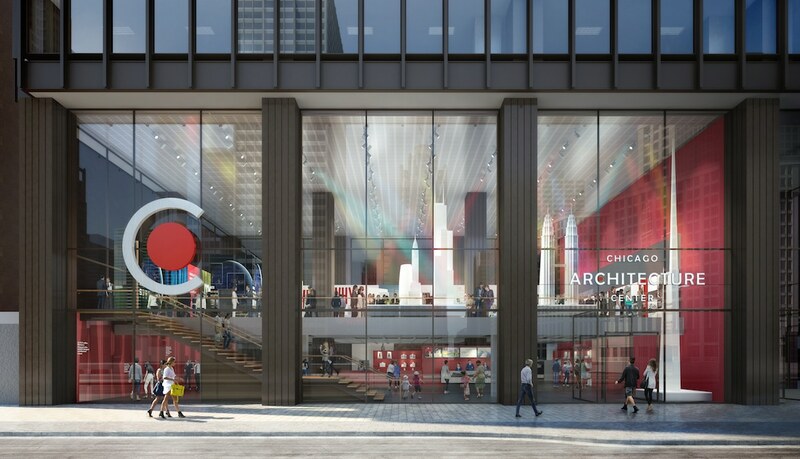 Designed by Chicago-based architecture firm Adrian Smith + Gordon Gill Architecture (AS + GG), the space will include areas for public programs, an award-winning store, and innovative exhibitions to help the public understand Chicago’s rich architectural history. 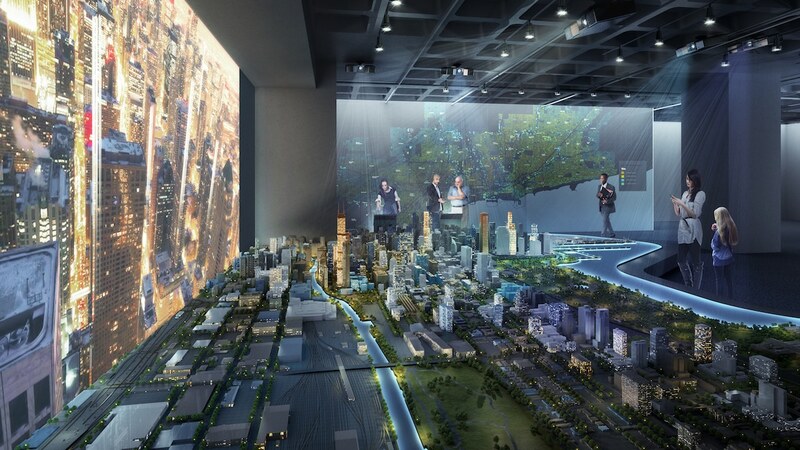 The CAC will also be a space to learn about international architecture, with the second-floor Skyscraper Gallery including large-scale models of famous skyscrapers around the world. AS+GG specifically designed an almost 40-foot-tall model of the Jeddah Tower in Saudi Arabi for the installation. 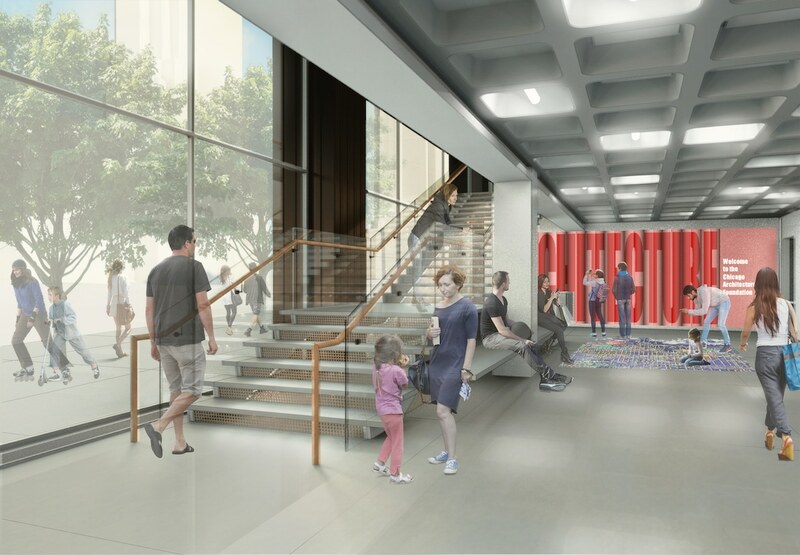 A little over 50 years after its founding, CAF has grown into one of the largest cultural organizations in Chicago. Through tours, field trips, mentorships, and professional development events, the Foundation continues its mission to show why design matters. 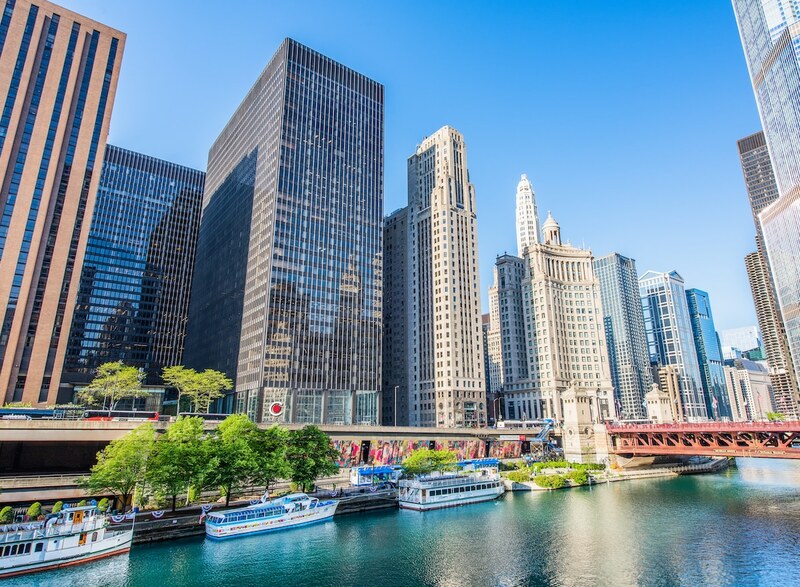 The retail store and walking and bus tours will begin from 111 East Wacker Drive during the first week of August, building toward a week of celebrations leading up to the August 31, 2018 inauguration. 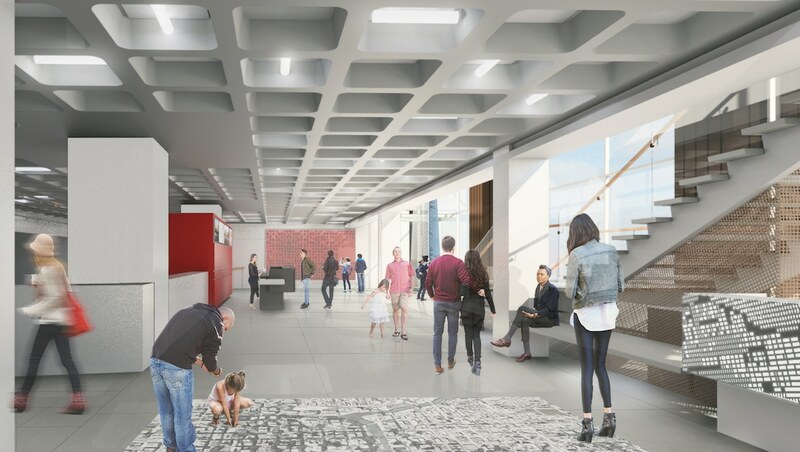 Opening on August 31, 2018, the Chicago Architecture Center is strategically inside a historically significant building along the Chicago River. 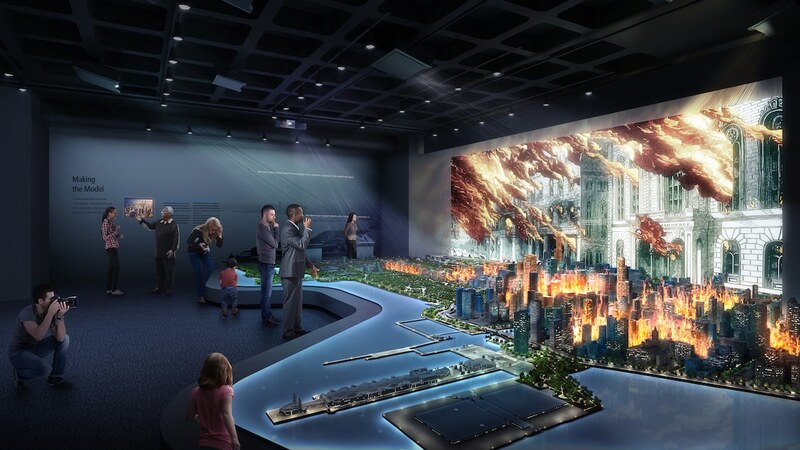 Interactive exhibitions across two floors will explain Chicago’s rich architectural history. 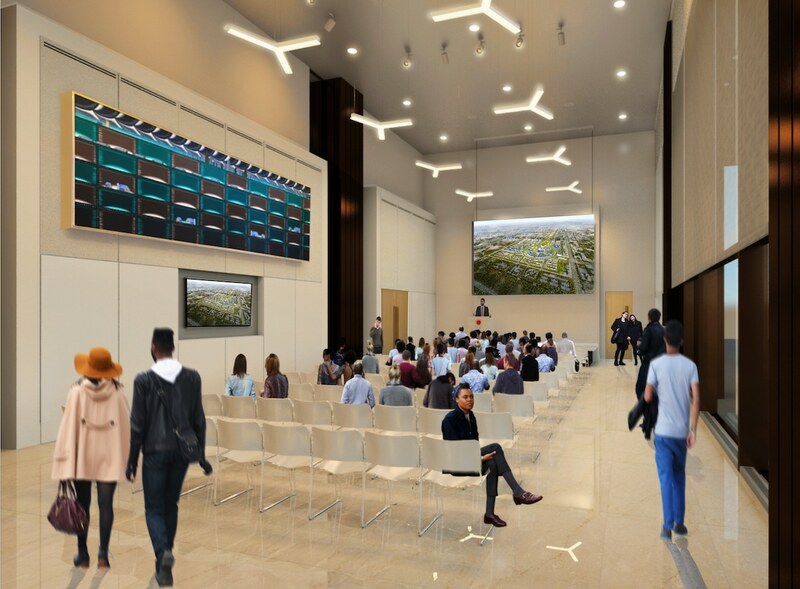 The center will also be a place of learning, with lecture halls and a design studio for professional development. My Modern Met granted permission to use images by CAF. Do you believe the earth is heating up and that our climate has changed for the worse in the last few decades? Do you believe the earth is heating up and that our climate has changed for the worse in the last few decades? Do you believe our grandchildren will live in a worse climate than we do and that climatic variation is one of the causes of extinction of several species? As humans, do you believe we have contributed to these climatic changes? If your answer to one or more of the questions above is ‘No’, then you are probably experiencing climate crisis denial. Scientists overwhelmingly agree that the climate crisis is no longer a distant problem. It is approaching and increasing in pace. Then, why aren’t people talking about it as much as most of the personal, professional or political problems? Why is there as much indifference and ignorance about the climate crisis that some call it a ‘hoax’? We have all heard about the vulnerability of the polar bear, the melting Arctic, and the ozone depletion. Why is there still disagreement on the climate crisis? It’s time that we start confronting climate change. Most living species have evolved through rigorous adaptation. A phenotype refers to observable traits or characteristics of a living organism. The term ‘phenotypic plasticity’ is simply the flexibility to change phenotypes in response to variation in external conditions. Studies have shown that living organisms that were phenotypically plastic could survive and adapt to intense climatic changes. Organisms that were phenotypically inflexible eventually ceased to exist. There is a growing amount of debate to theorize the role of phenotypic plasticity in natural selection which is considered to be a basic mechanism of evolution. For example, humans in the present time are taller than humans of the past. The difference is believed to be a result of the change in diet that we have undergone. Diet is an external, non-genetic factor. Climatic change will test the phenotypic plasticity of all species, including humans. 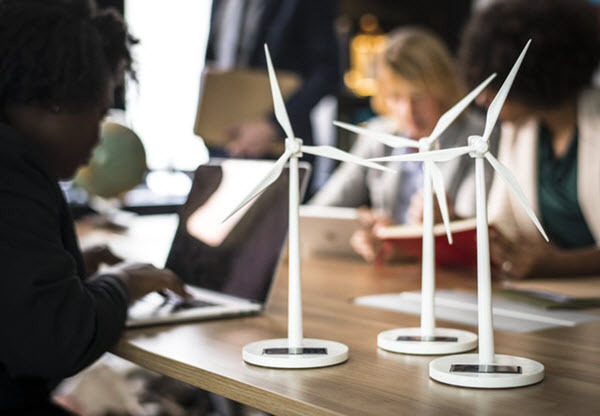 Environmental researchers Patricia Linville and Gregory Fischer coined the term “Pool of Worry” to explain why we consciously avoid talking about climate change. Human brains have tons of mundane worries that can be clubbed under S-I-P (Sudden, Immediate, Personal) thoughts. For example, a temporary financial loss is likely to cause us more grief than a degree rise in temperature. We are unwilling to spend our mental energy on something that we cannot see or feel immediately. The consequences of climate change unfold gradually and we cannot perceive the cumulative impact all at once. Most of us cannot begin to imagine the consequence of this crisis and prefer to keep the thought of it away from our consciousness. Humans tend to huddle in their comfort zone and the consequences of climate crisis is a direct threat to that. Thinking along the lines of how we are responsible for greenhouse emissions can evoke intense feelings of guilt, shame, fear, and anxiety. These are the feelings we deliberately try to avoid. Confronting a crisis of this nature can trigger defense mechanisms like denial, displacement, and rationalization that make us either indifferent or deny responsibility. The California University Laboratory on Climate Crisis has found that simply accepting the responsibility of our everyday actions like using plastic bags, eating more red meat, or using aerosol sprays, can make us up to 50% more willing to step up and take action. There is evidence that the amount of greenhouse gases such as methane and carbon dioxide (CO2) that we let out in the atmosphere is a major contributing factor to the climate change. The cumulative effect of these gases emitted by human activity is massive. We lack awareness or choose to ignore such actions that are ingrained in our lifestyles. Beef consumption, for instance, has increased more than three times in the last three decades and uses 40% of farmlands across the US. The cattle reared for the food industry are provided with heavy meals that make them burp methane regularly and on a large scale. A cow, on overage, releases roughly 100 kg of methane per year. The negative impact of a single molecule of methane on the climate is around 23 times higher than a molecule of CO2. The impact of emitting 100 kg of methane is then equivalent to the impact of emitting 2,300 kg of CO2 per year. They are both equivalent to burning 1,000 liters of petrol that can be used to drive roughly 12,500 km. Have you heard people argue that there is not enough proof of the climate crisis? Peter Wilson, a pioneer in the field of cognitive dissonance, said that we develop confirmation bias since we are terrified to tolerate the cost of being off-base. We, as social beings, are naturally inclined to seek conformity in groups – like family, colleagues, friends, or political associations. Confirmation bias influences us to search for and highlight snippets of data that follow what the majority of people in these groups consent to. We aimlessly acknowledge what the group acknowledges and reject what it does not. If an elected representative of a group says that global warming is a gimmick, many may consent. The fear of rejection and opposition by the group influences us to fit in with what it accepts or distrusts. Such bias distorts our cognitive balance and makes us pay less attention to available evidence in order to corroborate with the group. 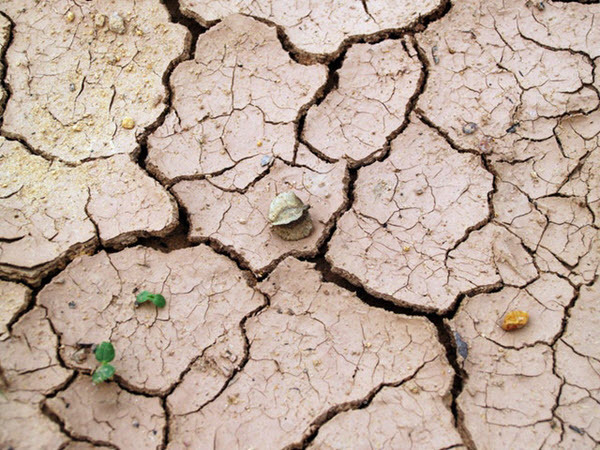 The climate crisis is enormous as far as its socio-economic and moral aspect are concerned. Simply denying it may seem to make it simpler. We need to learn about the negative impacts of our actions on the climate and consciously choose to develop environment-friendly habits. This includes using renewable energy resources. We need to be active in activities that promote safeguarding the environment. Go and sign petitions, join campaigns, and raise our voices to help slow down climate change. This is not the time to avoid talking. Our tiny footsteps do matter in bringing about change. Empathy is the need of the hour. Let’s think of the environment as our home. Let’s react to climate change in the way we would react to damage to our houses. We need to try to internalize the suffering climate change has caused to species of the past to realize its impact on the future. It is through empathy and understanding that we can overcome personal biases. The greatest of all human virtues is love. Saving the environment is not a political or a social fight, but a human one. We must nurture nature with love. There is no plan(et) B. 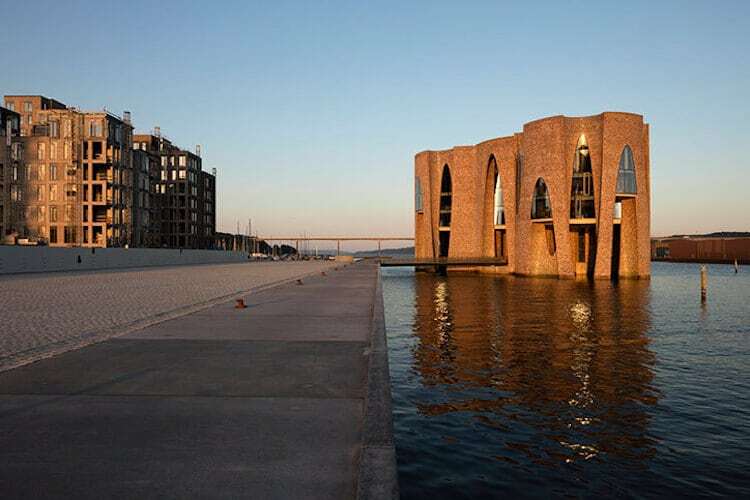 Four conjoined cylinders rising from the water form the core of Olafur Eliasson’s first foray into architecture. 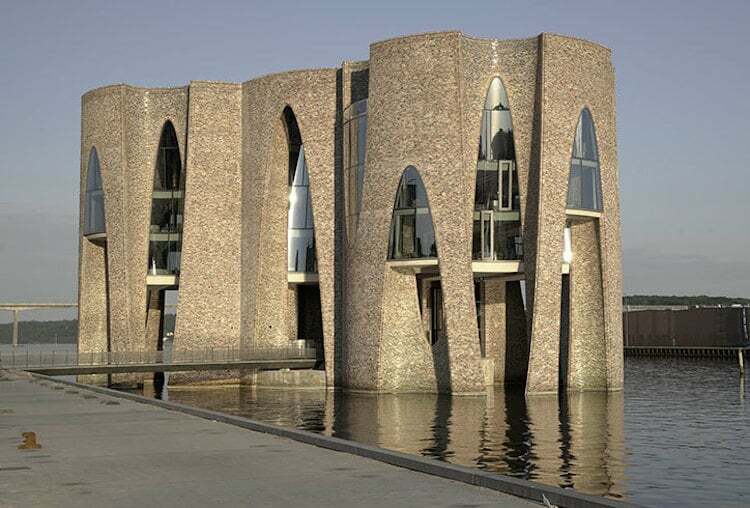 The Danish-Icelandic artist recently finished his first building, an office located in the Vejle Fjord in Denmark. The Fjordenhus is the base for Kirk Kaptal, a holding and investment company. 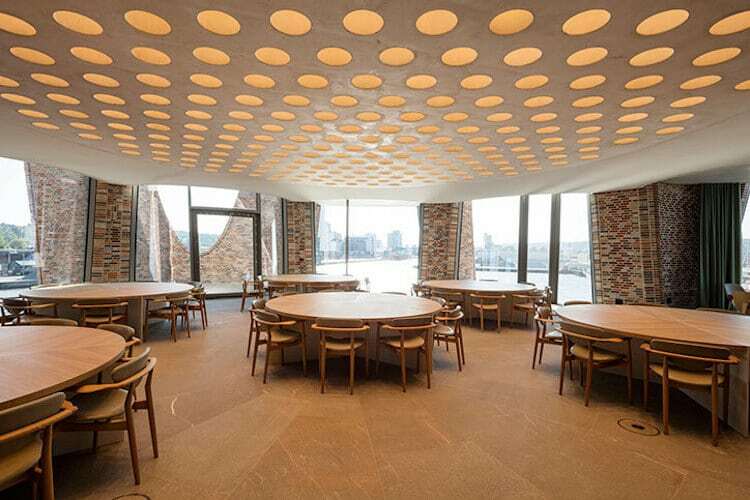 Not only did the firm hire Eliasson to execute the building, he also designed all the office furniture. 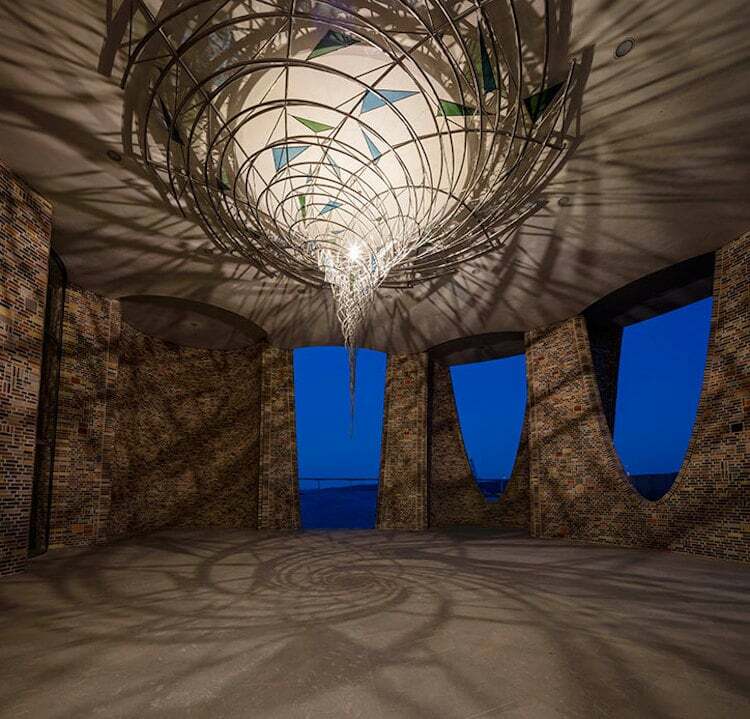 The experience was a moment for Eliasson to pull together all the lessons learned from years of creating large-scale art installations and focus it into a piece of architecture. 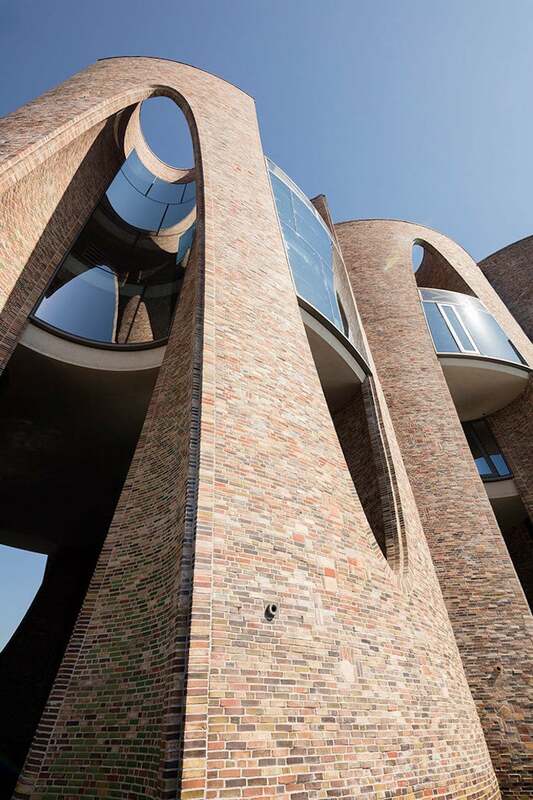 The inspiration for the structure, which is composed of 970,000 bricks, was the beauty of the surrounding environment. 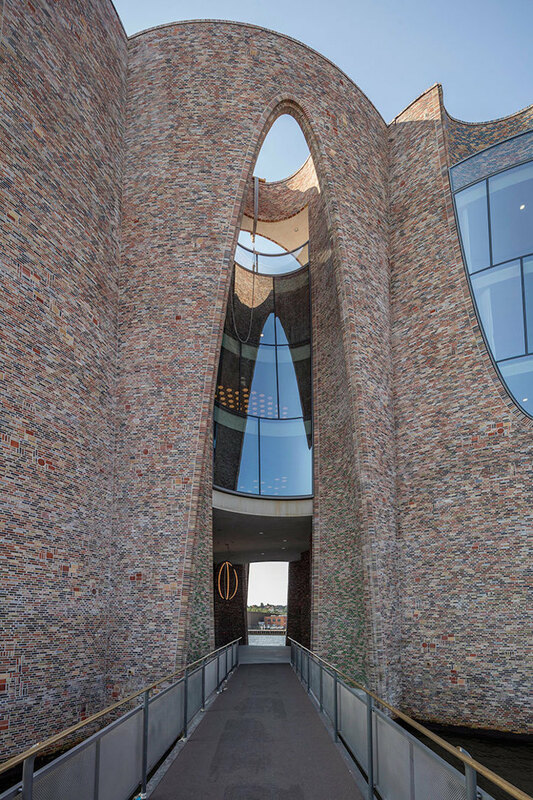 “[The clients said] we would like to build a working environment for the foundation that we have, we would like to emphasize the qualities that are important to us: nature, light, the weather, the seasons and the Vejle Fjord,” Eliasson shared. 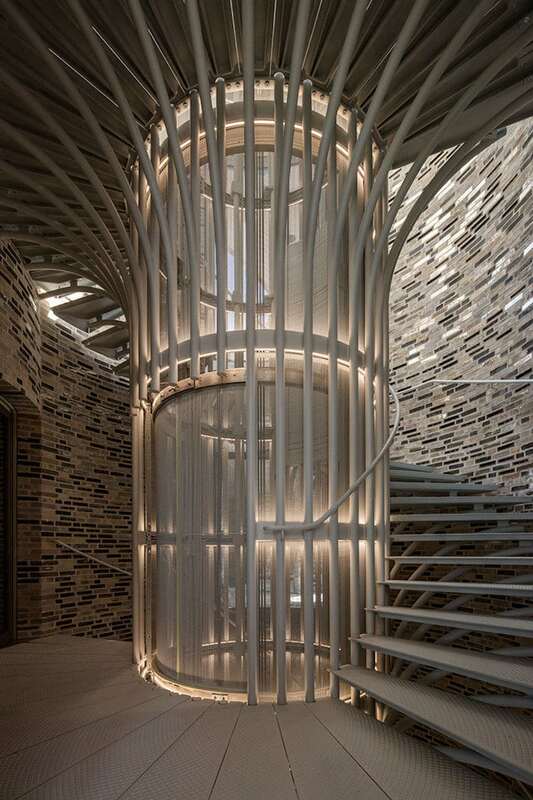 The structure rises from the water, seated on slender raised pillars that were created by selective cutouts in the cylinders. 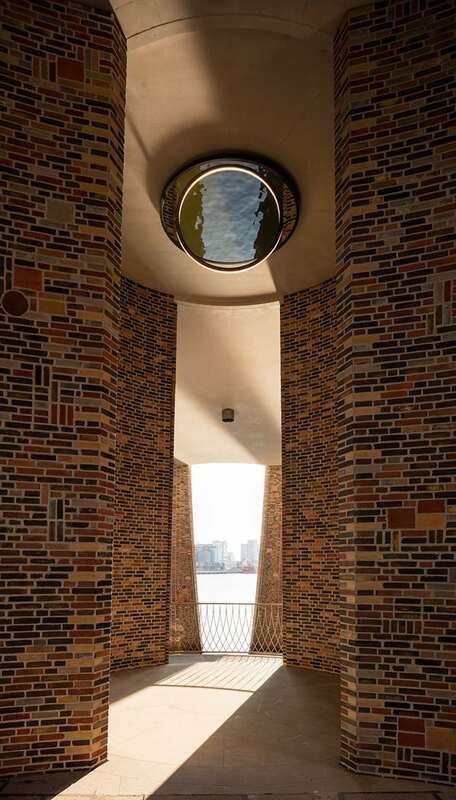 Eliasson was especially attentive to the brick exterior, selecting 15 shades of unglazed brick as well as glazed brick in hues of blue, green, and silver. 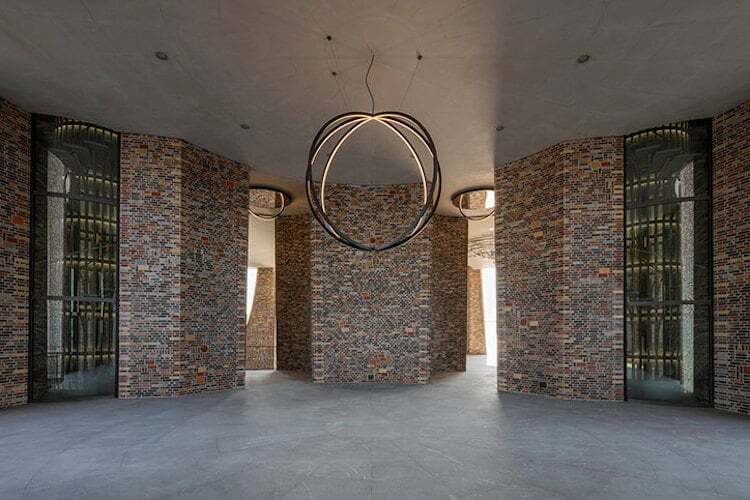 Eliasson then strategically placed the bricks to create different patterns and effects along the exterior, while the colors of the interior were chosen to match the rooms’ function. For instance, grey and silver bricks were installed exclusively in the stairwell. 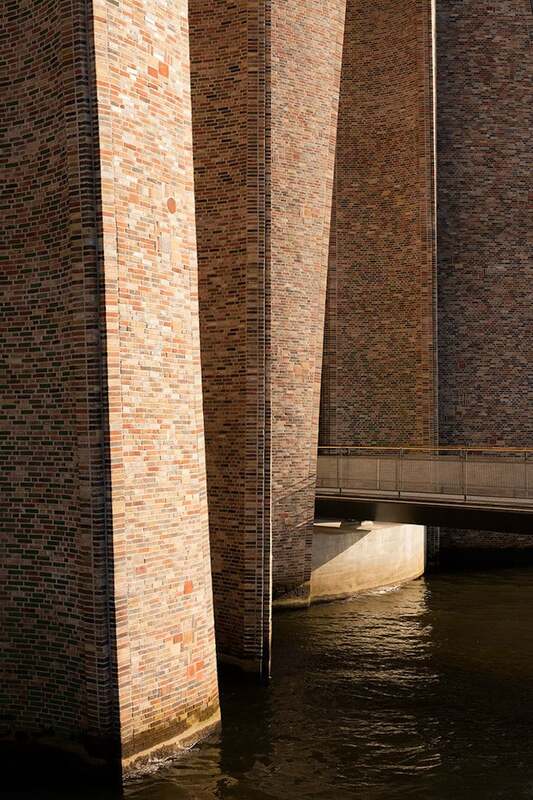 Fjordenhus is part of a larger plan for redeveloping Vejle’s harbor and is also a step forward in solidifying Eliasson’s journey into architecture. 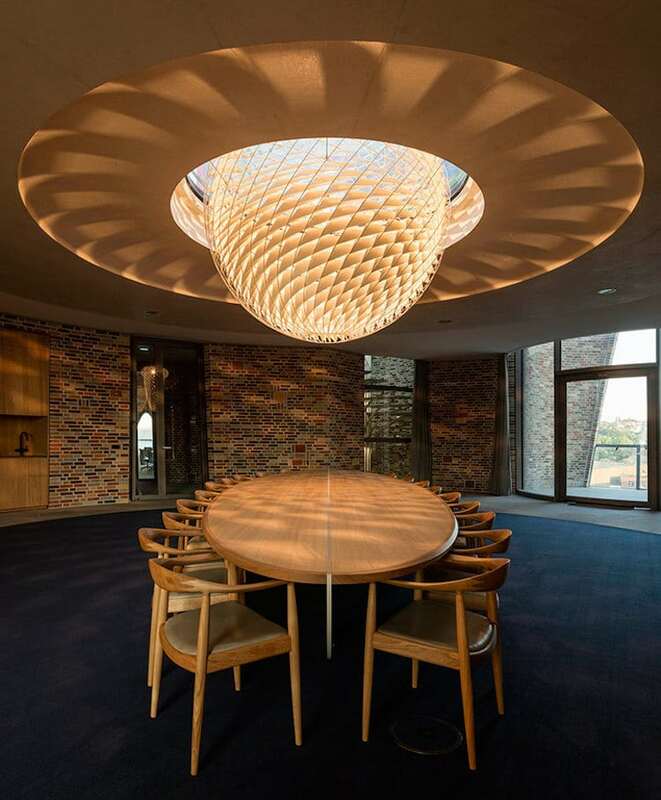 In 2014, Eliasson and Sebastian Behmann established Studio Other Spaces, an architectural practice tied to Eliasson’s studio—a sure sign there’s more to come from Eliasson the architect. All images via Anders Sune Berg, except where noted.